A three-day Workshop on ‘Recent Trends & Issues in School Administration and Leadership’ is being organised for the Head Teachers of elementary schools of District Kishtwar, from November 29 to December 01, 2018, at Govt. Boys Higher Secondary School, Kishtwar. The workshop is being organised by the Department of Educational Studies, Central University of Jammu under the aegis of School of Education, Pandit Madan Mohan Malviya National Mission on Teachers and Teaching (PMMMNMTT) – a national scheme of MHRD, Govt. 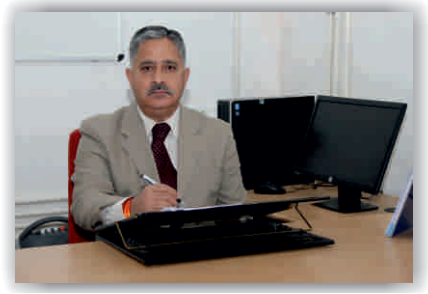 of India in collaboration with the Chief Education Officer of Kishtwar district, J&K state. The key objectives of the workshop are to develop essential skills, competencies and values needed for effective school administration and leadership; and to enable the head teachers of elementary schools to create congenial environment for teaching-learning in the school. Moreover, it aims to sensitize the administrators to deal effectively with the emerging issues and challenges pertaining to governance, management of human resources, teaching-learning activities and financial management, etc. in school education. About forty Head Teachers of elementary schools of Kistwar District of J&K are participating in the workshop. The programme-coordinator, Dr. Asit K. Mantry, welcomed the participants and resource persons and also briefed the genesis of the workshops and the vision and mission of the department of educational studies, central university of Jammu, in the line improving the quality of education throughout the state of J&K. Dr. Ravi Vanguri, Associate Co-ordinator of the workshop by emphasising the rationale of the workshop said that for effective administration of schools, there are some new trends related to educational administration and leadership have been adopted particularly in using technology, creating conducive environment for teaching-learning, community engagement, absenteeism, ethics, autonomy and accountability of teachers, financial issues, managing media, etc. Hence, keeping in view the need and significance of recent trends and issues related to educational administration and leadership, a three-day workshop has been planned for the government elementary school head teachers of Kishtwar district. The workshop was inaugurated by the eminent experts and resource persons in the field of school education and teacher-education. The Chief Education Officer of Kishtwar, Mr. Tariq Hussain Fozal has inaugurated the workshop as chief-guest. In his address, he emphasised that the education system does not function effectively with frail school administration. He vehemently said that the effective administration would be possible only through dynamic leaders who know very well how to inspire teachers and encourage the pupils to work together. Further, every administrator must know how to enlist the help of community for improving schools for all concerned. He critically pointed out that if administrator allows personal relationships or ambitions to dictate their decisions, the school environment will become one of the distrusts. The Key-note speaker of the workshop, Mr. Ashok Kumar, Principal, DIET, Kishtwar, in his address commented that various problems emerges from different dimensions but absence of an effective leadership is one of the main detriments for degradation of growth and development of an institution or organisation. He further said that the administrative officials of schools are teachers or principals who possessed rich experience in teaching and good knowledge of administration system. But, the experience invariably does not necessarily qualify one to become an effective leader. The guest of honour of the workshop Mr. Prahalad Bhagat, Principal of the Govt. Higher Secondary School (Boys) expressed that the educational administrators must adhere policies, even if they do not agree with them at personal-level. He strongly stated that dynamic leaders may not compromise with forfeiting the integrity of the system as well as development of an institution or organisation. The resource person of the workshop Mr. Mehboob Ahmed Kazi, Lecturer, DIET, Kishtwar, in his lecture focussed on the key aspects of institutional planning, use of ICT, community participation, scholarships, accountability, inclusion, etc. AT the end, Dr. Ravi Vanguri, Assistant Professor, department of educational studies, central university of Jammu, proposed a formal vote of thanks.